The level of rural employment diversification varies strongly within each country, which highlights the importance of territorial dimensions, in particular rural-urban linkages. The proximity to markets matters for the development of diversified rural economies. In southern Côte d’Ivoire and Ghana, for instance, rural areas that are close to the main urban agglomerations have more diverse rural economies. In Mali, communes along the Niger River show the highest employment diversification. 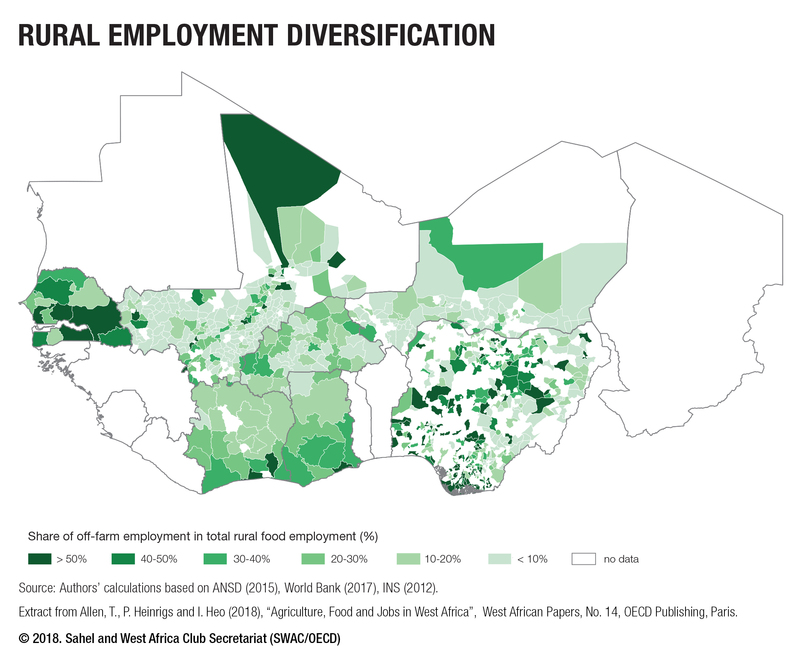 In Nigeria, in 99 out of the 299 local government areas covered, agricultural employment accounts for less than 50% of total employment. More connected rural areas generally offer more productive off-farm opportunities in downstream segments of agricultural value chains. Local availability and accessibility to food value chain infrastructure and services affects local labour markets and the demand for certain skills. Access to these off-farm employment opportunities in rural areas and small towns is especially important if countries want to create better and more inclusive jobs. By strengthening the links between the rural sector and small- and medium-sized cities, it will contribute to developing employment opportunities outside of major cities and building diversified and vibrant local economies.